Cherish a special moment by storing a memorable wine cork in our CORK CAGE® Ornaments! Remember your first shared bottle of wine, the toast at a party, or any celebratory event and Christmas. Start a new tradition by displaying that memory on your tree or attach it to a gift bag or bottle for that thoughtful touch. The CORK CAGE® – Hot Air Balloon Ornament features all the same hand-crafted detail that has made the CORK CAGE® a must-have for any wine lover! 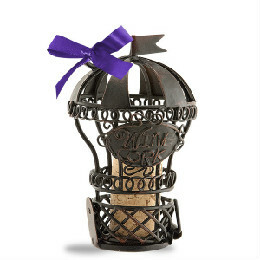 Includes an wine cork inside too, with “To & From” areas right on the cork to personalize your gift.